Metal fencing around DEP's emergency access road prevents access for picnics but may soon be coming down, according to RIOC. High, metal fencing around a grass-paved road designed for emergency access to the City Department of Environmental Protection's Water Tunnel Project #3 may be making its last stand, according to information received from RIOC, yesterday. RIOC President/CEO Susan Rosenthal tells The Daily that the State agency "met with DEP on Friday 4/5/2019 for a walkthrough of Access Road B." RIOC and DEP earn a warm thank you for that alone. In case you forgot, Friday was rainy, breezy and cold with a high in the mid 40s. Freezing precipitation was reported in locations around New York. "They will need to re-seed some of the grass area with hydroseed," Project Coordinator Michelle Edwards reported. "Once they complete the work, the fence will be taken down and the park will be transferred back to RIOC for maintenance." Edwards added that she'd "reach out to DEP for schedule on when they will complete the restoration work." The project first became controversial when DEP failed to keep a promise to move picnic tables, grills and the Sabrina statue to keep them available to park users, fencing them in instead. Then, for reasons never made public, the project dragged on through the summer, now nearly a year beyond its promised completion date. 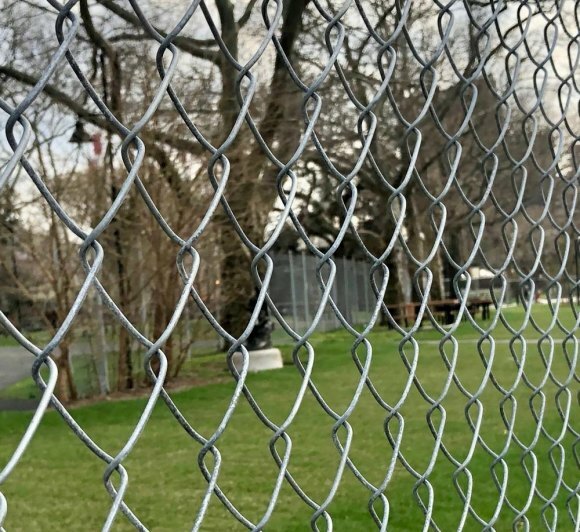 Last fall, RIOC won a small victory when Rosenthal and then Vice President Jacqueline Flug persuaded DEP to peal off green, plastic fence covering that wasn't just an eyesore but a safety hazard as well.